As previously mentioned in a Sights by Sam blog entry, the George Washington Bridge forms an important conduit between New England and the Mid-Atlantic States. In conjunction with the Great Gray Bridge, there exists another unsung hero of New York’s transportation system in the immediate area. 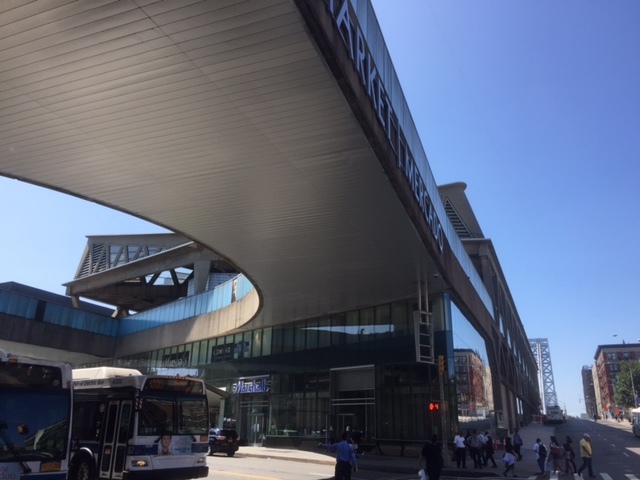 Built in 1963, the George Washington Bridge Bus Station services commuters coming into Upper Manhattan via the bridge. Constructed by the Port Authority of New York and New Jersey (PANYNJ) to get buses off of the streets of Washington Heights, the bus station was built by Dr. Pier Luigi Nervi, who designed the Olympic Stadium in Rome. Although it made innovative use of poured concrete (poured in 26 sections) and won accolades for its use, it has not had much love from the local population or commuters for its design. The station itself takes up two city blocks and has direct ramps on and off of the bridge. New Jersey Transit, the main public transit authority in the Garden State, is the main tenant. Other smaller providers and van services that ply between Upper Manhattan and Jersey City also call on the station. Today, the 15 berths at the terminal service buses coming from Upstate New York and New Jersey. The PANYNJ is also in the midst of a multimillion dollar renovation project that will add retail and hopefully bring more people into the station. While the bus station is not quite the destination that most people think of, it does have great views of the George Washington Bridge. 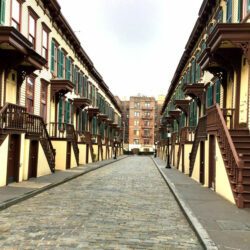 It also has direct access to the A train and is within an easy walk (or another quick city bus ride) away from the High Bridge, Sylvan Terrace, and the Morris-Jumel Mansion, among many others. This is the type of information that you will learn on a Sights by Sam tour.